National Women’s Health and Fitness Day is observed annually on the last Wednesday of September. As we’ve encouraged you to get outside and be active all summer, we’re attempting to continue that push into fall and winter. The colder weather and busier school schedules definitely may tighten your scheduled and put a damper on you motivation, but that doesn’t mean the health routines need to stop. Women’s Health and Fitness Day is a perfect time to reignite that wellness plan after everyone has gone back to school or work. Since its founding in 2002 by the Health Information Resource Center, this day has become the largest annual health promotion for women; and there is no stopping it now! This day can be celebrated in so many ways, it is going to be hard to choose. We want to provide you with a list of our favorite activities for Women’s Health and Fitness Day. All activities and exercises can be done alone, with friends, a dog, or more! The health and fitness doesn’t need to be constrained just to one day. Make your health and fitness day, a health and fitness year! Join a gym and continue your good wellness and exercise routines weekly. What you do at the gym is up to you, but joining one will help motivate you to continuously exercise and stay active. Easy enough right? Going for a walk is the easiest way to observe this day. It is also very relaxing and enjoyable. This is a perfect way to celebrate health and fitness day while also de-stressing, taking time for yourself and your thoughts; or, going with a friend and catching up on life. Whatever way you want to walk works! Similar to walking, running is perfect for Women’s Health and Fitness Day. Once again, go alone, grab a friend, grab your dog, just go for a light run or jog to clear your head and burn some calories. Not into doing a workout that feels like a workout? Try a sport! Go swimming, grab a friend and play tennis, a few friends and play volleyball, soccer, whatever it may be. You could also join a casual team, that way you’re consistently staying active throughout the year! Maybe your workouts are in check and you are always active. Try a new superfood that people have been raving about! Implement chia seeds, maca powder, protein powder, or something else into your daily food intake. Or, just simply try and eat more vegetables and protein in a day. Swap out the chips for carrots, try making kale chips, avocado brownies; look up healthy recipes and swaps and check it out! Have trouble getting your daily water intake to a normal level? Set a goal for the amount of water you’ll drink during Women’s Health and Fitness Day! Rub out all that extra stress you’re holding onto with a massage. Massage therapy will help with internal stress as well as physical stress that your body endures from exercise and other activity. Definitely a great thing to try out during Health and Fitness day. Also, Elements Massage in Whitefish Bay is offering 50% off extra time for your massages! Get 30 extra minutes for just 15$ during the month of September! Maybe you’ve been a big runner or walker or organized sport athlete or weight lifter for awhile now. Take this as an opportunity to switch things up! Try a new workout class, go lift weights instead of running, join an intramural sport, etc. 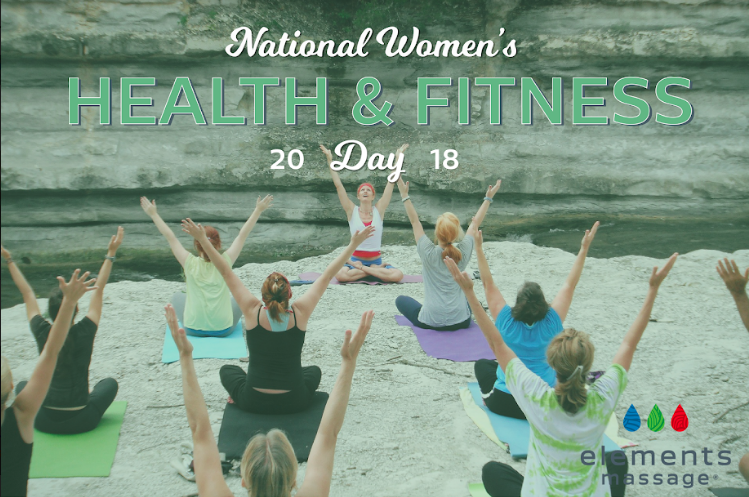 What are you thinking you’ll do on Women’s Health and Fitness Day? New exercises, new foods, sports, join a gym, schedule a massage? Whatever it may be, make sure to do something to help relieve all that stress and achieve your wellness, health, and fitness goals!